Our dive center in Dahab is located in Masbat Bay at the end of Shara Fanar (Lighthouse Street). 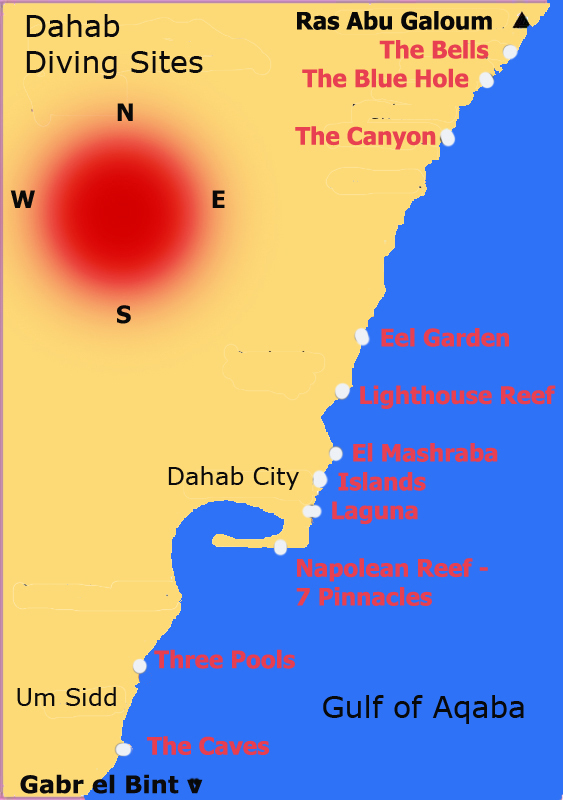 The house reef is Lighthouse, directly on the beach at Marine Garden Camp. You can dive the outside perimeter of the Blue Hole, aka 'The Bells�, by starting 100 meters to the north of the Blue Hole. You enter by descending through a chimney, exiting at 27 meters in the blue, (or shallower for OW divers), and continue by drifting along an amazing wall-dive. There are attractive overhangs with a rich growth of black coral that enhance the drop-off. Be sure to look into the blue and you may see a turtle or reef-shark. 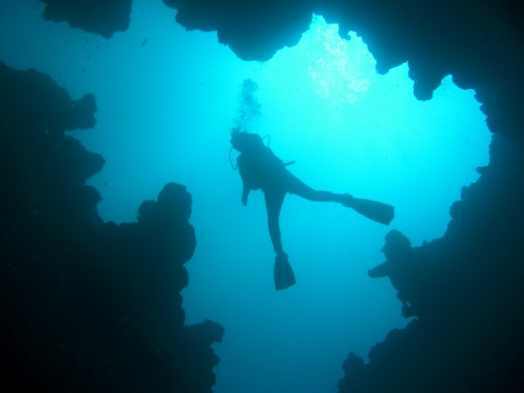 This spectacular dive site is formed by a crack in a gorgeous coral garden, taking you into a huge cavern under the sea-bed that drops to 30 meters. 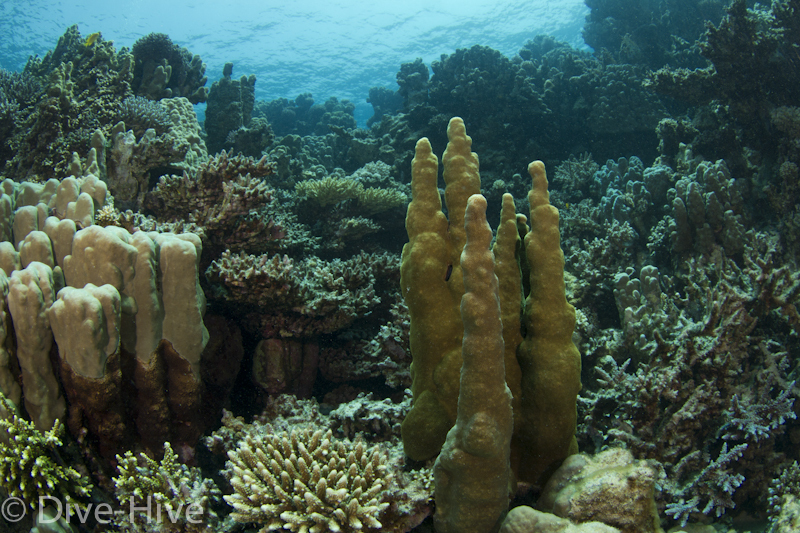 The Canyon continues to the outside of the reef, and becomes very narrow when going deeper toward the outside of the reef. In the opposite direction there is the �Fishbowl�, a small grotto full of Glassfish. The Canyon is an incredible night dive, especially during a full moon. 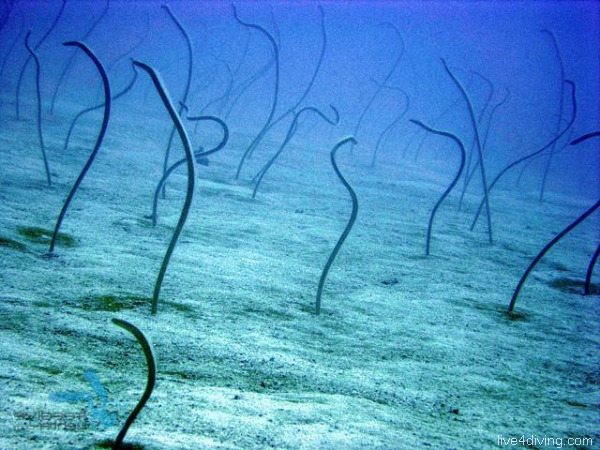 The name comes from the colony of thousands of garden Eels that you can find sticking out of the sand. Eel Garden lies about 500 meters north of the Lighthouse and can be easily reached by jeep or pickup in a couple of minutes. Eel Garden is a very popular and exciting dive site, which has various habitats, from sandy slopes and shallow lagoons to reef walls with many hard and soft corals. It is best as an early morning dive for the best light, or in the late afternoon when all the fish come to feed. The central spot in Dahab, Lighthouse is home to many species of fish, offering fantastic dives, as well as ideal conditions for courses. 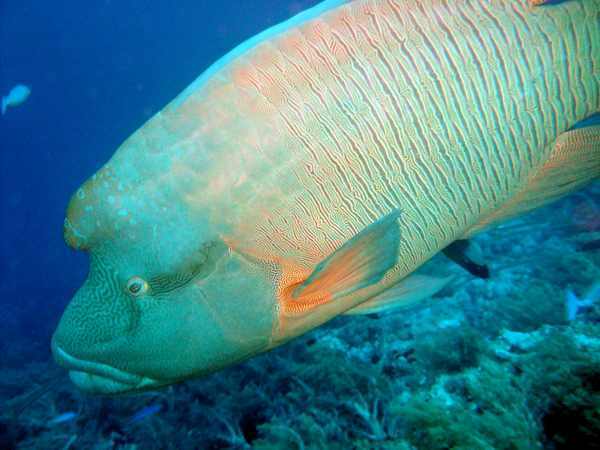 Napoleon Wrasse, Turtles, big Groupers and colourful Nudibranchs are common to see. Sometimes there are bait-balls, attracting Dolphins and Manta Rays. Lighthouse is also a perfect night dive site. Mashraba is a site rich in different habitats and sea-life, from sea-grass hosting seahorse and turtles, sandy slopes full of flounders, sea-moths, and frog fish, to mini-reefs rich in biodiversity. There are octopus, morays and a large variety of shrimp. Often large eagle rays and dolphins are seen here, more than any other dive-site in Dahab. 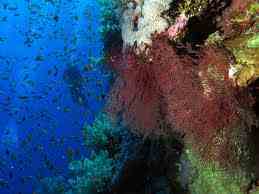 At the start of the reef is a large pinnacle with glassfish, pajama slugs, lots of lion-fish, and large groupers. As the reef turns southwards, another pinnacle often explodes with life at dusk, so this dive is best as a late afternoon dive. 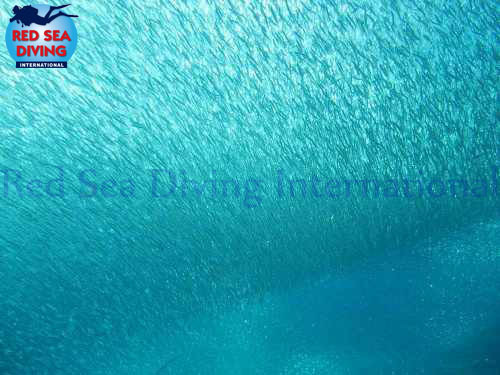 A shallow dive with a maximum of 16 meters depth, consisting of 3 underwater coral islands that form valleys of corridors and lagoons that are teaming with life. This is home for a school of juvenile barracuda, trevally, and large snapper. There is a diverse array of vibrant corals mixed with blue spotted stingrays, napoleon wrasse, turtles and sometimes reef-sharks! There are interesting rock pinnacles with glassfish, goldfish, angelfish, and lion-fish. Perfect for photographers and videographers! Not actually a dive site, although Seven Pinnacles and Napoleon Reef are around the corner. 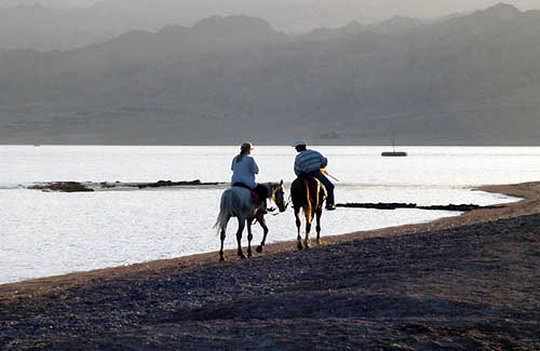 The Lagoona is featured as a place for many activities, such as horse-back riding, a session of yoga at sunset, and simply walking or riding bicycles. It is a great place to explore above the water. Under water you will find a marvelous coral garden with several huge island-like coral blocks forming a real labyrinth of hills and canyons. There lives a school of young barracudas, and you often see napoleons and other big fish. 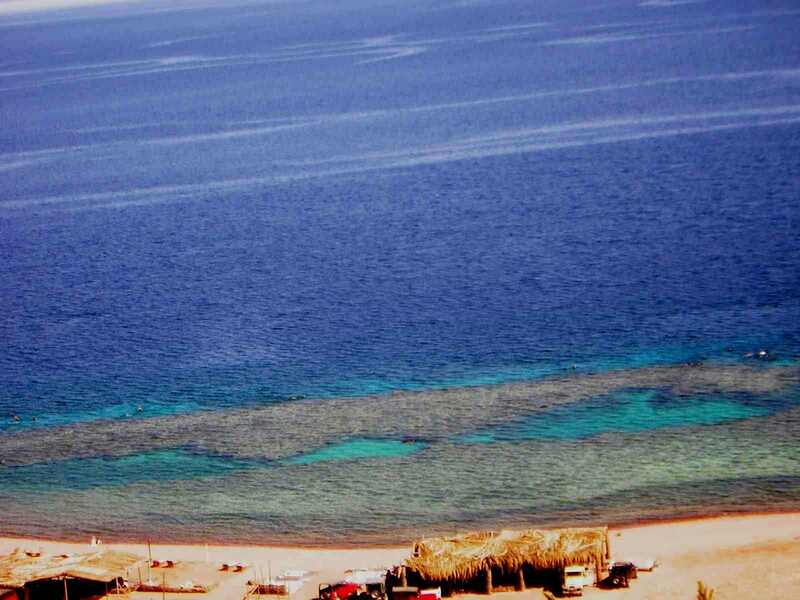 The reef crops out into the lagoona, catching some very strong currents, but with the currents superb soft corals grow with colors you won�t see anywhere else in Dahab. As you drop down to deeper water, there are larger fish hanging out swimming against the current and some perfect examples of deep-water black corals. You will always spot napoleon fish here � hence the name! Three Pools is named after its 3 shallow lagoons. The lagoons are divided into three basins by coral walls which form the entrance to a fantastic coral garden. You enter at the first lagoon and dive through the three pools to a drop-off at the exterior of the reef table. 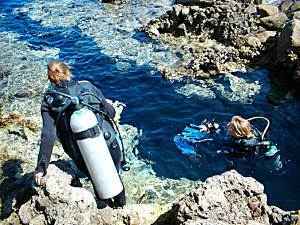 At this dive site there are three caves below the top of the reef. 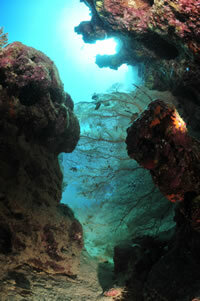 This is a good dive site for the unusual rock formations and variety of mollusks, crustaceans, and fish. You will need a torch inside the caves.